I count myself as something of an amateur chronicler, gadding about with quill in hand. However, today we meet a man who was more than an amateur and devoted himself to producing a history of the county he loved, Francis Blomefield. Blomefield was born the son of Alice and Henry, a farmer. As an intelligent boy, the Blomefields recognised the importance of ensuring that the young Francis enjoyed the benefits of a good education and sent him to Diss and Thetford Grammar Schools. Whilst at school he travelled around Norfolk and the surrounding areas cataloguing inscriptions from notable monuments and recording genealogical notes of local noble families. By the time he moved up to Cambridge at the age of 18, he had set his sights on writing a history of the antiquities of his home county, a project that fascinated him. 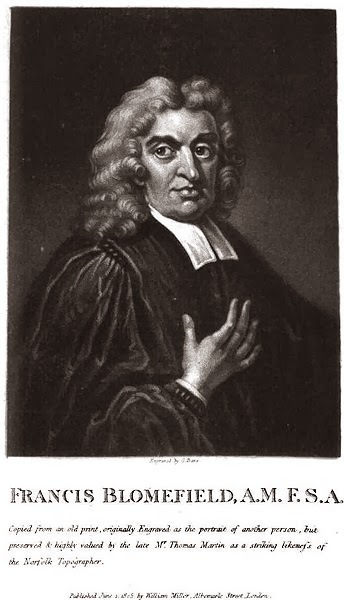 His research continuing alongside his studies, Blomefield graduated with his Masters in 1728 and a year later assumed his father's former role as as rector of Fersfield. Happily settled in his new parish, Blomefield married a fellow rector's daughter, Mary Womack, in 1732 and the couple had three children. In the year of his marriage the rector was granted access to Peter Le Neve's vast library and collection of original materials regarding the history of Norfolk, an event that must surely have thrilled this county-chronicler. Using this as his inspiration and guide, Blomefield expended his horizons and instead decided to write a partwork topographical history of Norfolk, in addition to his long-cherished history project. The first volume of the topographical works appeared in 1736 and the first part of the History of Norfolk followed some three years later, printed on Blomefield's own press. The painstaking work continued throughout the next decade with the publication of a second volume and preparation of a third. However, his plans were to be vexed when he contracted smallpox whilst visiting London and died before the third volume could be completed. Blomefield's friend, Charles Parkin, completed the topographical history to the best of his ability and the final volumes were published between 1769 and 1775. The work remains one of the best examples of Georgian local history, with Blomefield's passion and knowledge shining through.